First, we must diversify our approach to advocacy. Our campaigns in Massachusetts, New York, Washington D.C., California, Texas, and Illinois have all presented the facts of an issue we care about and demanded that others care too. Doing so is critical, and we will continue running hard-hitting campaigns alongside other organizations who are committed to educating Americans. However, we know from engagement with our community that different approaches let us connect with different people. The many Americans who understandably find politics dubious and tedious may be willing to spare a few more moments of their day for a beautiful piece of art, an inspiring story, or a moving poem. Palestine Advocacy Project wants to try and reach them there. Second, we believe that we have a responsibility to present Palestinians as more than just political entities. It is of course critical to teach Americans about the Nakba and Israel’s subsequent occupation of Palestine, but discussing Palestinians only in that context is dehumanizing, and it helps to frame Palestinians as “Israel’s problem.” We want Americans to recognize Palestinians as people with a past and a future worth fighting for. Finally, we realize that organizations are themselves members of their communities, and that we cannot ask our fellow members for their interest and their outrage if we do not also give back. 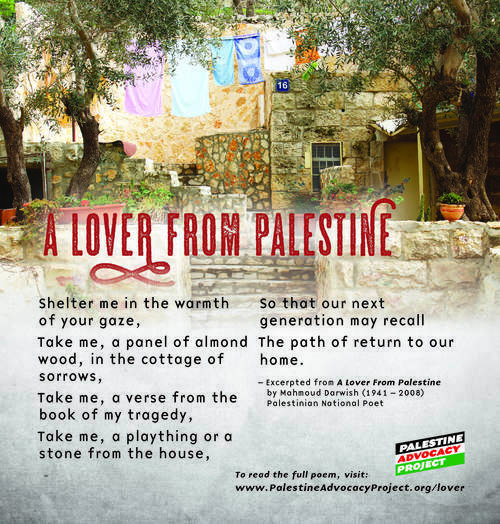 The Poetry Campaign is our gift, our attempt to bring a little inspiration, a little beauty, a little humility, a little hope, and a little bit of Palestine to their morning commute.